"Try this cognac- and creme de cacao-flavored pie that is great for company. Be sure to make it ahead of time so it has time to chill." In a saucepan, allow gelatin to soften in cold water. Add 1/3 cup sugar, salt, and beaten egg yolks; blend together. Heat over low heat stirring until gelatin dissolves and mixture coats spoon. Do not bring to a boil. In a mixing bowl, beat egg whites until stiff; while beating, slowly add rest of sugar. Fold egg white and sugar mixture into the thickened filling. Whip the heavy cream and gently fold half of it into the cognac mixture. Pour into graham cracker crust; cover and refrigerate for an hour. 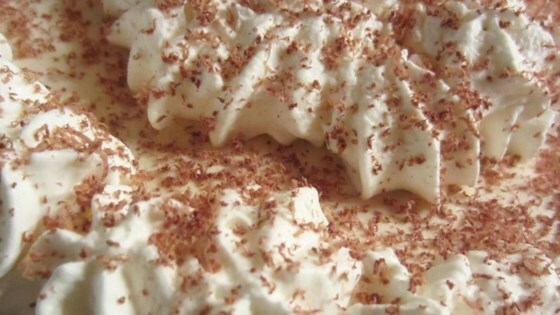 Garnish with remaining whipped cream and chocolate curls. I have been looking for this recipe for 15 years. Everyone loves it...especially women for some reason. It is light and tastes fantastic!!! The flavor was good but the filling didn't thicken properly. It started to crystallize instead. I ended up putting it in the freezer because it stayed too liquid otherwise. YUM! Made this for company a couple of nights ago and they went wild for it! Thank you for a great recipe! A similar recipe appeared in the NYTimes magazine a gazillion years ago, and I used to make it often. It feel out of my repertoire and I was glad to be reminded if it and make it again. Ooh, Ooh fantastic flavor with the cognac and creme de caca-not strong-just a casual hint of delightful liquer! This is a reeeeeally good pie! Light, fluffy and sweet. Creamy, a little booze'y and with some chocolate curls on top - what woman could resist this? Girls night in! !